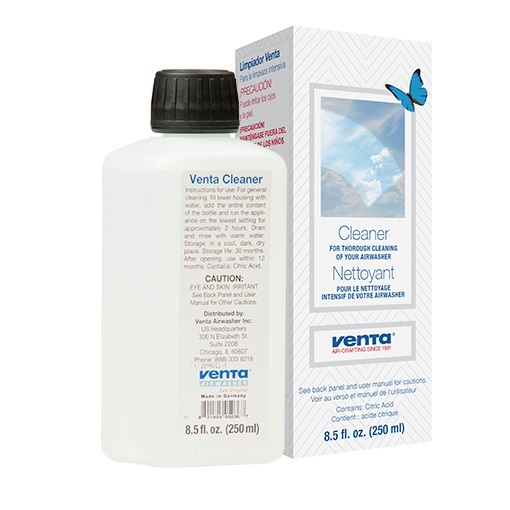 The Venta Cleaner has been specifically formulated for the thorough cleaning of Venta Airwashers and Hybrid models. Usage of the Venta Cleaner is recommended every six months for a deep cleaning, as well as before long-term storage to ensure any possible residue is removed. Designed for use on the 5 Series Lower Housing and Disc Stacks or poured directly into the water reservoir of our 6 Series units, the Venta Cleaner will improve the function of the Venta Airwasher, providing clean air for years to come.